The kitchen is the place where your family gathers most often and where they actively spend a lot of time. Since it is the room in your home that gets the most use, it is of no surprise that it is the room that also takes the biggest beating and gets messy quickly. Keeping your kitchen clean and organized as you and other family members prepare meals is a challenge indeed. If you think about it, having a well-organized kitchen will make your life much easier. An organized kitchen is a kitchen that is easier to clean and far more likely to stay clean. 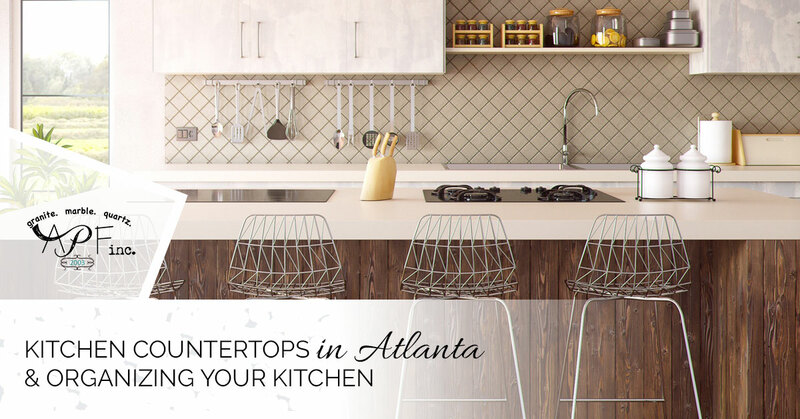 A Polished Finish, your source for new kitchen countertops in Atlanta, offers these tips to an organized kitchen. Don’t think that you can clean your refrigerator once or twice and then it is good to go. This is a task that needs to be done quite often. By pulling out all of the food, scrubbing the shelves and determining what needs to be thrown out, it helps you declutter and gives you the room you need to store tonight’s leftovers. It also makes your refrigerator smell good. If you take a trip to Bed, Bath and Beyond or some similar store, there will be an entire section devoted to kitchen organization. This is where you will want to be. Start off with several drawer dividers so you can grab the whisk you need without having to rummage through layers of kitchen utensils. Lazy Susans are great because they help you find the spices and other items you need without having to pull things out of your cupboards. And there’s more. All you have to do is type in kitchen organizers on Amazon and you will be introduced to literally hundreds of cool items you can use to help keep your kitchen organized. Swapping out bags of food with clear storage containers makes everything look nicer and allows you to see what you have stored. Just think about how nice the inside of your cabinets will look with clear containers neatly stacked showing off your pasta, grains and flours. Do you have 13 cookbooks, 12 that you have never used? Then it makes perfect sense to get rid of the ones you don’t need. In fact, you might want to consider loading all of the recipes you use into a cookbook app and toss all 13 cookbooks. The same goes for the utensils you have collected over the years and now only gather dust at the back of some random drawer. Besides, nobody needs five spaghetti servers. We are also willing to bet that you have a pasta press that you got as a wedding gift 20 years ago that is still in the box as well as numerous other gadgets you have received as gifts or bought thinking you would someday use it that could be passed down to children or re-gifted. Whatever it takes to rid your kitchen of these items you don’t use and that take up precious space. The inside of your cabinet doors is wasted space. Instead of leaving them blank, you could use this space to install hooks and store measuring cups, utensils and pot covers. You can even build a knife block onto the inside of a cabinet door and store your cutlery. Here is a clever idea; paint the inside of one of your cabinet doors with blackboard paint and use it as a grocery list. Place hooks underneath cabinets and store coffee mugs there or hang a stemware rack and store wine glasses. You can line hooks up on the sides of your cabinets to store utensils, oven mitts and other kitchen gadgets. Once you have your kitchen completely organized, it is time to upgrade your kitchen with beautiful new countertops from A Polished Finish. Granite countertops would look great in your kitchen, unless, of course, you have your heart set on quartz countertops. In your day-to-day duties in your kitchen, it is very helpful to have durable countertops that are easy to clean. Contact us today.